America the Powerless Price Reduced! 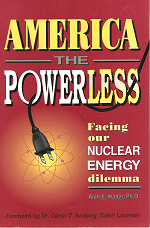 America the Powerless is an easy-to-read book by Dr. Alan Waltar that makes the case for nuclear-generated electric power as the best energy option for our society. Focusing on the issues that concern the public regarding nuclear energy, Waltar confronts numerous anti-nuclear objections and systematically dismantles the myths and misconceptions behind them. The book’s foreword is by Nobel laureate Glenn T. Seaborg. Waltar was the 40th president of the American Nuclear Society. He has chaired numerous committees at the Society. In 1984, he was elected an ANS Fellow, the highest grade of membership offered by the Society. He recently retired as senior advisor and director of nuclear energy for the Pacific Northwest National Laboratory in Richland, Washington. He was previously Professor and Head of Nuclear Engineering at Texas A&M University.